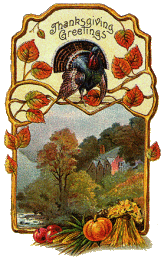 Posted on November 13, 2006 by Barbara H.
I thought that this week before Thanksgiving would be a good time to share several Thanksgiving- related items in my files. Next week a lot of people will likely be busy with preparing for the holiday or traveling, so I wanted to go ahead over several days this week and share some things with you. Elisabeth Elliot has Thanksgiving For What Is Given in her Nov./Dec. 1985 newsletter, A New Thanksgiving in the Nov./Dec. 1987 one, An Overflowing Cup in the Nov./Dec. 1991 one, and To Offer Thanks Is To Learn Contentment in the Nov./Dec. 1995 one, A Dog’s Thanksgiving in the Nov./Dec. 1998 one. Annie’s Pages have tons of idea. The Make This a Different Thanksgiving page has some great suggestions near the bottom of the page. Some Thanksgiving quotes are here. More Thanksgiving quotes are here. Abraham Lincoln’s Thanksgiving Proclamation is here. Thanksgiving “funnies” are here and A “Redneck Thanksgiving” is here. Thanksgiving poems are here and More Thanksgiving poems are here. This entry was posted in Holidays, Poems, Seasons, Thoughts From Scripture by Barbara H.. Bookmark the permalink. Barbara, thanks for the suggestions! These look like some great sites. I like Julia’s graphics, they are so pretty. And she does have alot of neat ideas to use for ministry purposes. I haven’t been on her site in years, so thanks for reminding me! Thanks for sharing those thanksgiving ideas with us. Thank you for all the wonderful links, Barbara! I’m so glad you joined me this week! When I click on the Abraham Lincoln’s Thanksgivng Proclamation your website tells me I’m looking for a link or site that is not there. Maybe it could be corrected? Thanks. That’s really odd! I don’t know what happened to that post, but I found it somewhere else online and fixed the link. Thanks for letting me know!